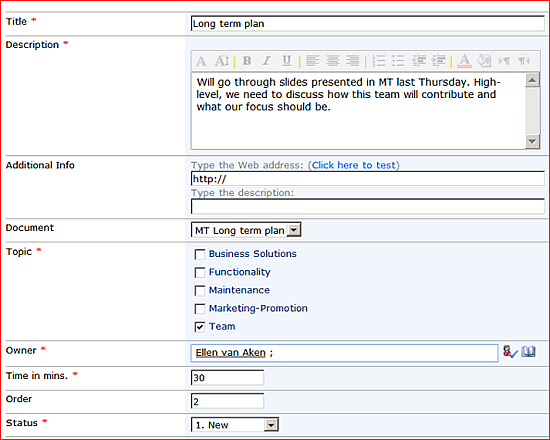 SharePoint: No more meeting minutes! When I visit “collaborative” sites, e.g. for a team, a department or a project, I often find a document library called ”Meetings”, or even worse, several document libraries, each for one particular meeting date. These generally contain documents for prereading, presentations from the meeting, agenda and minutes. And sometimes they have an action or decision list as well. Do you still store everything in document format, while there are ways to do things directly online? It may be time to move to a simpler process. Of course, there is the Meeting Workspace but sometimes you prefer to have everything in one site. The MW will also no longer be supported in SP2013. An alternative is the Meeting-Agenda-and-Minutes List, combining agenda, meeting minutes and decisions in one list. Our team started this in about 2002 and we have happily used it for our weekly team meeting for years. Everything you discuss is first, an agenda item. The owner of the item creates and manages it themselves. It may be wise to measure time involved in the current meeting setup beforehand and to compare that to the new setup. This informaton will also help you to convince others.